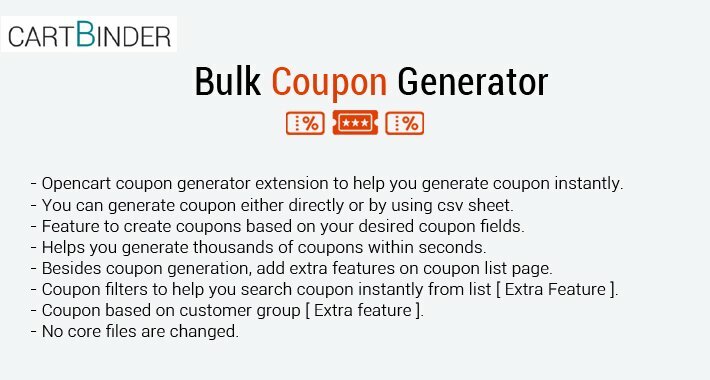 This an opencart extension for generating bulk coupons instantly based on your settings added to the module. You also get some extra features to make your coupon system better. 1) The extension helps you generate lots of coupons instantly. 2) The coupons are generated within seconds. 3) If you want to generate random coupons instantly you can use the Automatic method . 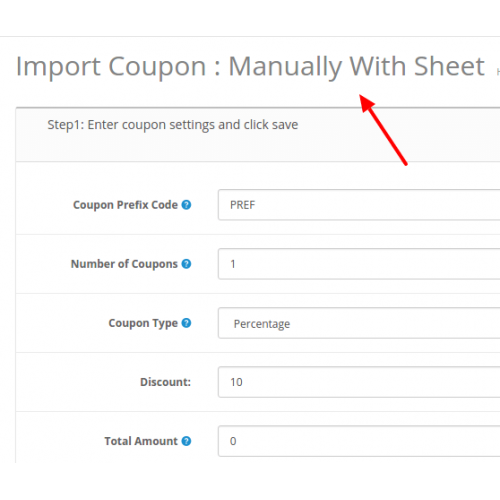 4) If you have a CSV sheet, then you can upload coupons manually using CSV sheet option. 5) It takes 10 to 15 seconds to upload around 5000 coupons. 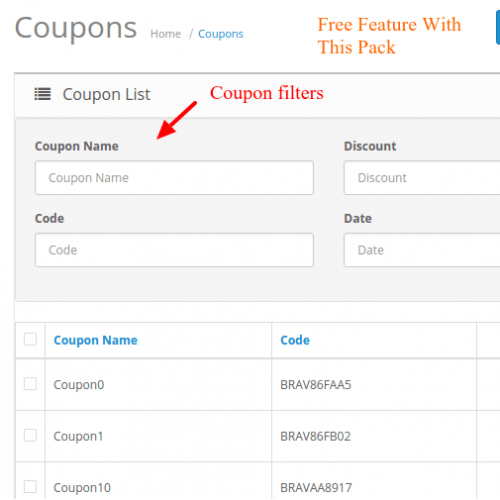 a) Coupon filters to help you find coupons easily. b) Coupons based on customer group. 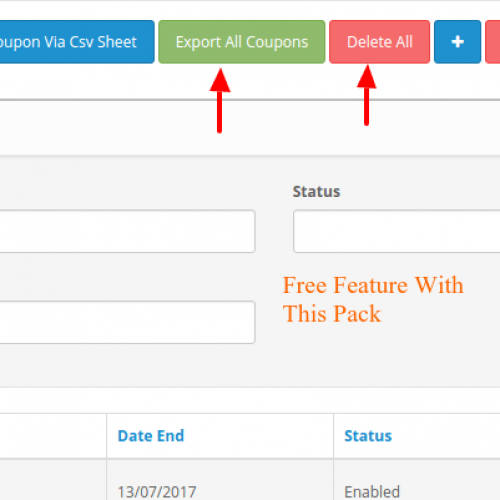 d) Export all coupons ( CSV format ). 1) In this method, you only need to fill coupon settings according to your preferences and save it. 2) So just fill the coupon fields for coupon generation. 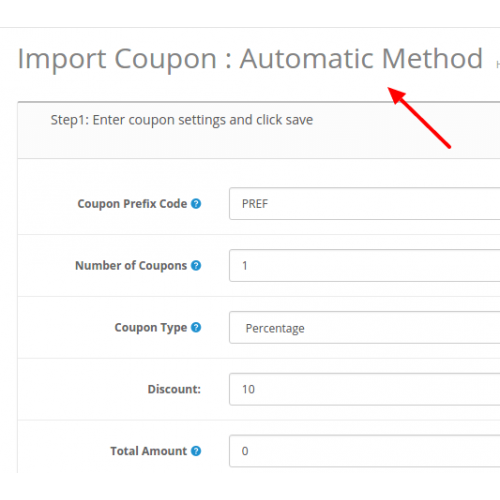 3) Next just click "Import" button to automatically import all coupons based on your preference. 4) Coupon codes are generated randomly. 5) Coupon code also can have some desired prefix code. Ex: SUMMER,HAPPY,FREE,etc..
1)In this method, you only need to fill coupon settings according to your preferences and save it. 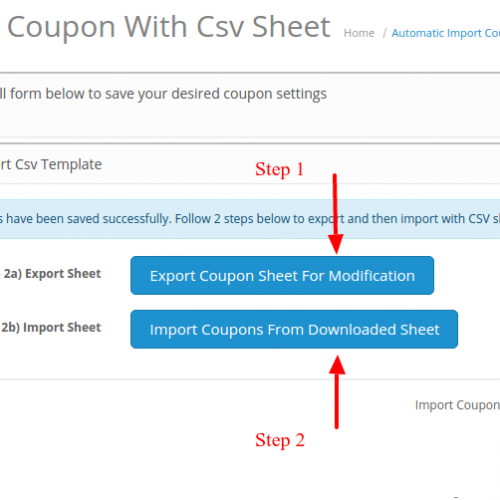 2) Next step you need to export the CSV sheet based on your coupon settings. 3) You can also start with empty CSV sheet. But format should be same as an exported sheet. 4) Coupon codes are generated randomly in this exported sheet. 6) Now if you want to modify this sheet you can. 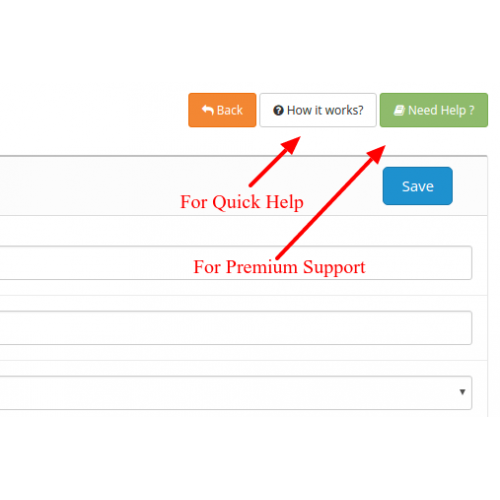 Like adding your own coupon codes, changing other coupon fields, etc. 8) Once all modification is done or you have created your coupon CSV sheet. 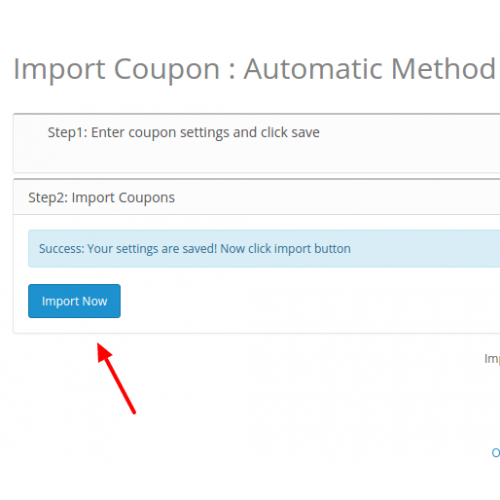 9) You can click on" Import" button to import the coupons. 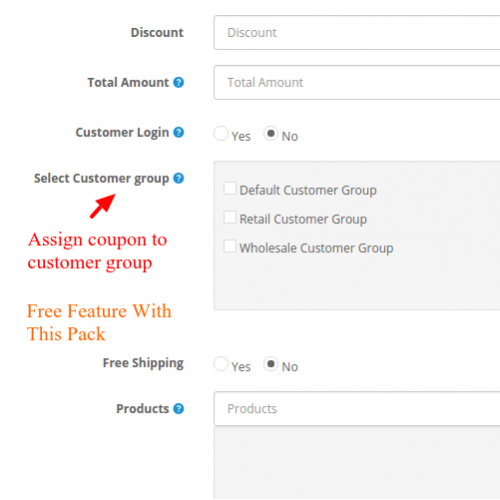 1) You can assign coupon to selected customer groups. So only those particular customer group can use those coupons. 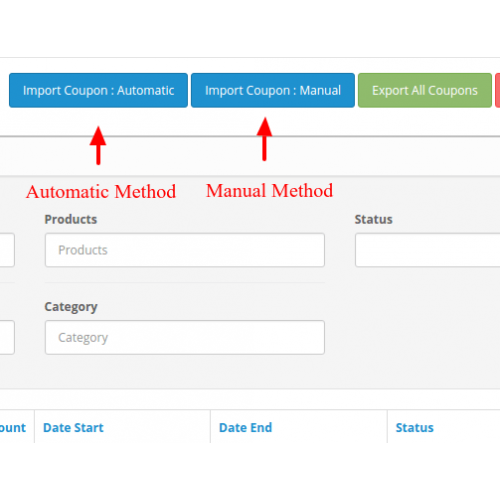 2) Import coupons with random code just by filling a single form with your own preference. 3) Import coupons with your own coupon code using CSV spreadsheet with your own preferred settings. 4) Delete all coupons with just 1 click. - Added how it works, support link. - Works on vqmod for 1.5.x. I loved this extension. It was light and very effective. In addition, I needed some extra custom work done to this extension and it was completed to my specifications in a timely manner. This is an excellent developer. Very prompt. Always answered all my questions. Very good work also. His support is also top notch and he is very courteous. It truly was a pleasure to work with him and I will use him again for sure. Thank you so much. Fantastic plugin worked perfectly. Tip: When importing CSV use FF rather than IE. 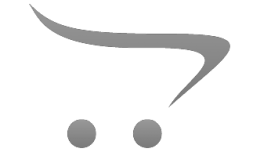 About If you are using default checkout system. Coupon cannot be added to the checkout page. This extension helps you to add new block under payment method..
About The extension makes adding attributes to product very simple and quick. 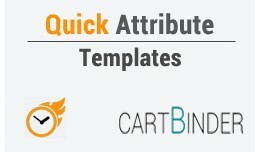 If you don't use attributes, then this extension is not for you. This exten..